This site assumes you sew. It's a site to share reviews on patterns that are available (especially those online) for sewing modest dresses and clothing for women and girls. For resources on how to sew, we've added a few to our resources page. We've also added a page on different sewing courses you can purchase online. And we recently found a site that offers a PDF file for sale on how to make a one hour dress, which we have reviewed. We hope you find these resources helpful. If you're looking for downloadable, printable patterns, we are now selling our snood hat pattern and our fleece beret pattern. The snood pattern is also available for free with instructions on the snood page. There is a free tudor style beret pattern with instructions on the make a beret page. The fleece beret is a different style. We've added links to some ready made modest dresses we've found online, since many people are finding this site searching for modest dresses and clothing. We've also added a selection of berets available online. And in an effort to lend a support to sites that care about modesty, we've incorporated Modesty Theme Gifts into a small store here on this site. Shop for gifts by sites that care. If you have become discouraged trying to find ready-to-wear modest dresses, try sewing your own. You choose the pattern, you choose the fabric, you often get much closer to what it is you're looking for in a modest dress. And if you don't sew, or don't want to sew your own, you can hire reasonably priced seamstresses to do the job. There's a list on the CommonSensePatterns.com seamstress page. Also, CandleOnTheHill.com lists some seamstresses, as does the SewModest.org seamstresses listing. On the left hand nav bar, I've set up the links by general subject. Below I describe my first general experience with a variety of online vendors. If you are looking for some onine sewing tips, I've added a page reviewing some sewing courses, tips, and secrets that are available online. Online courses are ideal for advancing at your own pace, trying something new without investing too much at once, and having a permanent copy of the instructions by the instructor. How to Sew a Snood! 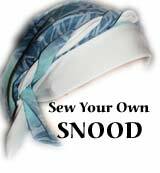 Instructions for sewing your own snood. I finally also managed to make the pattern downloadable and printable. It took a lot more work than I'd anticipated, so the printable one is for sale on my snood pattern page. How to Sew a Beret! Instructions and a downloadable pattern for you to print to make a Tudor style beret. Includes tips for wearing your beret. Setting Snaps with the Dritz tool! If you have had trouble with this tool, try taking the instructions really slowly. I've pointed out some of the places you have to be careful. I recently realized that besides findng great pattern bargains on eBay.com, you can find whole LOTS of patterns (a bunch of patterns sold as a group) for really great prices. Make your own pattern collections for mixing and matching! I immediately downloaded the catalogs available online for browsing products. My favorites were the Common Sense patterns. I decided to see how the ordering and delivery would go on a small trial order first. Read our review of the Petal Sleeve Dress and the Button Front Jumper. Both of these patterns make nice modern modest dresses. The Petal Sleeve Dress, when made in a fancy fabric, would make a great modest prom dress. In fact, the Petal Sleeve Dress looks very similar to the Easy Prom Dress pattern shown on Sewing modest prom dresses. They've got great tips there, but personally, I do like to have a printed pattern, like the one I bought from CommomSense patterns. In any case, I've added a whole page about the various online options for modest prom dress patterns. A friend of mine introduced me to Birch Street patterns. She was ordering anyway, so we saved on the shipping by ordering together and splitting the payment. I only ordered two patterns the first time, one actually from Folkwear-Birchstreet.com. They share the same shopping cart, so you can easily order from both sites at the same time. This is exciting for those who enjoy folk style clothing and more modern designs at the same time. I ordered the Godet skirt and vest, and the Wall Street blouse and skirt. The patterns are on high quality paper, clearly marked, and the instructions are very clear. A great bonus with these patterns is that each comes in a multi-size pattern spanning about 10 sizes! This is a great value for sewing households. With one pattern I am able to sew for myself and my pre-teen daughter. The instructions recommend cutting the pieces on the largest size and using a marking wheel and tracing paper to mark the material to the size you want. I always find that this destroys patterns quickly, so I prefer to use Swiss tracing paper and trace the patterns in the sizes I want. This preserves the original pattern and you can adjust each size accordingly. Read our full reviews of the Godet Skirt and Vest, and the Wall Street Skirt. These patterns are really great. Below are yet more pattern reviews from BirchStreetClothing.com (can you tell I'm a fan?). Trumpet Skirt and Blouse -- Easy Circle Skirt Pattern! Girl's Spiral Skirt -- A girl's bias swirl skirt. Women's Spiral Skirt -- A swirly bias skirt pattern. I bought my first Elizabeth Lee Designs pattern in 1994, when I was expecting my second child. Someone had given me a Motherwear nursing dress, and I was in love with the concept, but not the price tags. Not to mention that during spring and summer it can be difficult to find dresses with long sleeves and a higher neckline on Motherwear. I saw an ad for nursing dress patterns in a maternity magazine while in my midwives' waiting room and sent for the catalog. Now Elizabeth Lee is online, too. Nursing dresses are perfect for modest nursing. A discreet opening is covered, usually by a panel. You don't have to lift your shirt up to nurse, you don't have to unbutton your blouse, just pull the panel over and scoot baby's face up. I loved my nursing dresses. The patterns I own are: Nursing Classics 101, Nursing Classics 108, Nursing Classics 102. My cowl necked NC101 is still a favorite dress of mine, even long past nursing. At the time I got some discounts on other purchases and also purchased a pattern called Nettie which was a Babe too! pattern. I made a full length version, and wasn't really happy with it. It was too narrow for me to get into comfortably, though maybe in a knit it would have been fine. All the patterns came with easy to follow instructions, were well illustrated, and had lots of creative tip ideas. I loved them. In fact, I'm probably going to make them in non-nursing format, since they are modest and stylish and classy! The Butterick/McCalls Pattern Company prints my designs for me and they are very professional looking. They are the same size as McCalls patterns. I write my instructions with the novice sewer in mind. My first pattern includes mini sewing lessons for sewing with knits, selecting the proper amount of ease, and doing a full bust adjustment, along with tips for securing nursing openings. I have purchased and used most of Elizabeth Lee's Patterns, but wanted some styles that were less boxy. So I designed my patterns with curved side seams to help nursing mothers look slimmer. The first 3 patterns will use knits for comfortable garments that are easy to work in. I try to give my patrons value for their money and include as much as possible in one envelope without being confusing. Glad to have you online, BlessedDesigns.com! Blessed Designs patterns are also available on line at New Little Blessings. Jennifer Dean has written up a review of another pattern they carry by Baker Lane. The dress is a designed to be a total motherhood dress: maternity, nursing, and beyond! Check out her review of Catherine's Choice Maternity/Nursing Dress. Co-Owner of New Little Blessings, Caroline, has written up a review of the Modest Nursing Jumper. Many of us purchase our patterns offline, or have a large stash of common commercial brands of patterns. Feel free to contact us to send in your reviews for posting. Have you purchased modest clothing patterns online? If you have ordered modest clothing patterns online, I'd love to hear from you. When I order books and software at Amazon.com, I find the customer reviews extremely helpful. If you have any experience with buying patterns online and sewing modest clothing from them, your review can help someone else with their decision making process.